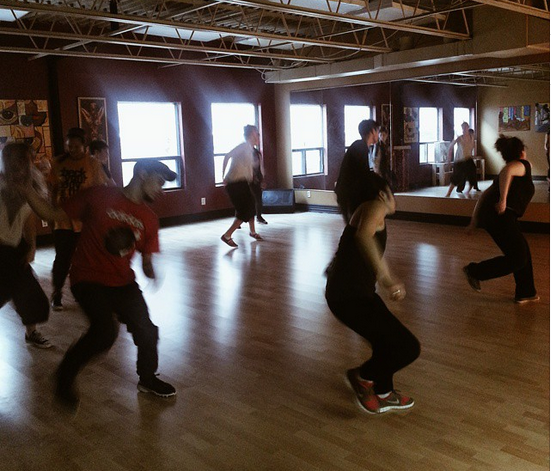 We are the only dance studio in Ottawa dedicated to teaching and promoting the urban dance styles of Popping, Breaking, House, Locking, Hip Hop, and Dancehall. Our goal is to provide the best dance education to our students, promote a healthy and positive atmosphere for creative expression, and raise the level and quality of street dancing in Capital City! Check us out today! Web_Buttons-01Often referred to as “breakdancing” in the media, breakin (or b-boying/b-girling) is a popular style of street dance that is considered one of the original 4 Hip Hop Elements. It was created in the “Boogie Down” Bronx in New York City in the 1970s. The dance consists of Top Rock, Go Downs, Footwork, Power Moves and Freezes. It is danced to both Hip-Hop and Break Beats (samples remixed from popular funk tracks). 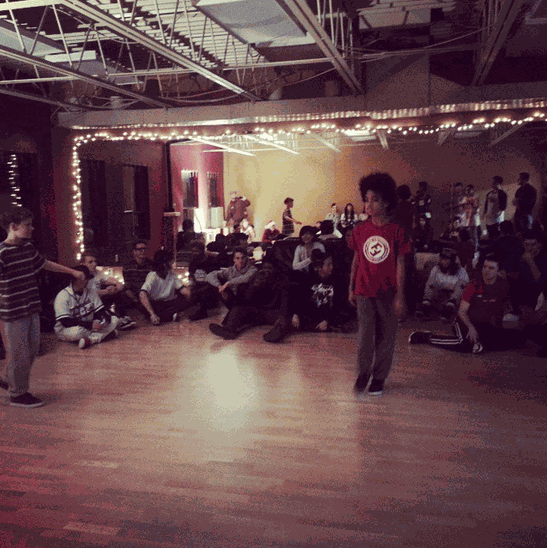 Breakin is often done in a battle, (formal or informal dance competitions), or danced in a Cypher (dance circle).  This is a more intensive class that offers fast paced teaching. In this class you will drill a wide variety of dance techniques associated with that style. 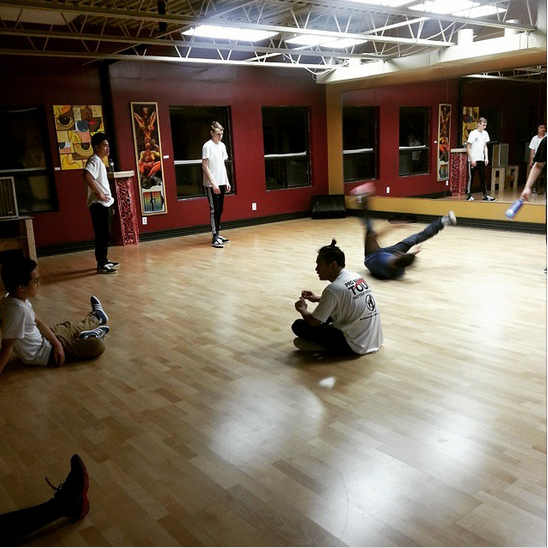 The instructor might have a dance cypher at the end of class or put a routine together to help blend the techniques of the dance style. (Drop in/ Drop in class card) . A dance of the 1980s, house dance originated in Chicago and grew up in New York CityWeb_Buttons-01. The name House comes from, “The Warehouse”, a club in Chicago where seminal DJ-Producers began mixing drum machines with disco, funk and soul records, a combination which gave rise to the soulful electronic sound we now know as house. The dance style has evolved a lot over many years, incorporating moves from Jazz, Latin, HipHop, Breakin, Lindy Hop, Tap, and Capoeira, but its main elements: Jacking, Stomping, Skating, Footwork, and Lofting remain the foundation of the dance. House Dance is typical done in a “Cypher” (Dance Circle), where dancers share their moves with each other. Web_Buttons-01Is one of the original funk styles of dance that came out of Fresno, California in the 1970s. It is based on the technique of quickly contracting and relaxing muscles to cause a jerk in the dancer’s body, referred to as a pop, tick or a hit. The pop is performed continuously to the rhythm of a song in combination with various movements and poses. Popping is also used as an umbrella term to refer to a group of closely related illusionary dance styles and techniques that are often integrated with popping to create a more varied performance. These styles include, Boogaloo, Animation, Ticking, Waving, and more. Popping is often danced in Cyphers (Dance Circles), battles(formal or informal dance competitions), or on stage. Web_Buttons-04Dancehall class is open to beginners and experienced dancers and will focus on learning the foundations and movement qualities that go hand in hand with the mainstream and underground Dancehall music of today. Dancehall music is a subgenre of Reggae and originates from Jamaica when faster rhythms and digital instrumentation came into play and became a huge hit with the public. Web_Buttons-01 Vogueing originated in Harlem ballrooms in the 30s and 40s. Inspired by Vogue magazine covers, it uses lines, angles and images to create complex and awe inspiring movement patterns. This class will focus on learning the foundation associated with three main styles of Vogue: Old Way, New Way, Femme. It will start with a thorough warm up and stretching routine, followed by basic techniques and drills. You will learn the history of Vogue and Ballroom Culture as well as posing and runway walking. Web_Buttons-01This class will explore the more recent expressions of Hip Hop dance and the style that has evolved as part of hip-hop culture. This includes the Hip Hop party dance of the 80′s and 90′s and the more recent dance moves and choreographies. 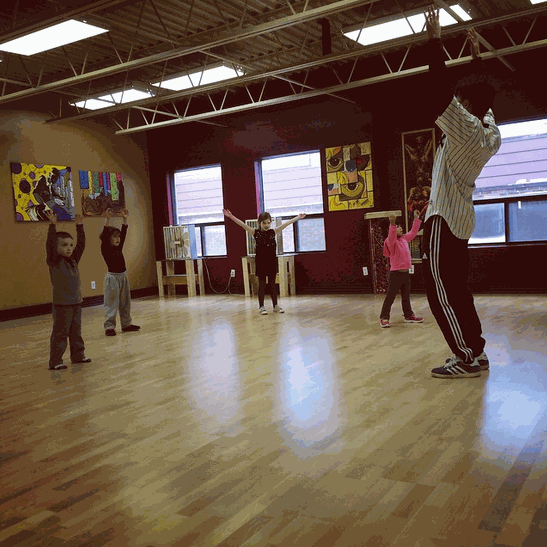 Hip-hop dance as seen today is a broad category that incorporates a variety of old and new urban dance styles. (The older styles that were created in the 1970s include breaking, and the funk styles). Lyrical hip-hop is a fluid and more interpretive version of new-style hip-hop most often danced to down tempo hip-hop or R&B music. The dance is mainly showcased in “Cyphers” (Dance Circles) or set in choreographies often developed for the stage.